Original Hours: These are the estimated hours of a card itself, so this doesn’t include estimate from its Tasks or child Cards. Total Hours: These hours depends on the workspace’s “Time Based Estimate” settings seen above. 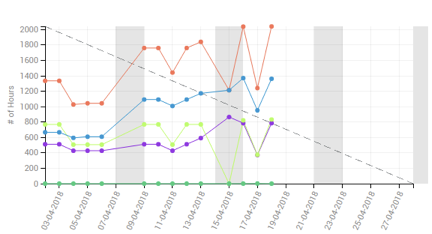 Reported Hours: These include the sum of hours added by users on the card, its tasks or child cards based on the setting above. Completed Hours: This will be count same as Total Hours above but only for Cards/Child cards/Tasks in done state. Remaining Hours: These hours depends on the Workspace’s “Time Based Estimate” settings as shown below. 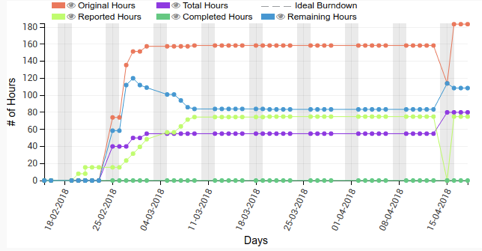 Ideal Burndown shows the completion date of a specific Iteration/Sprint based on the Total Hours and Capacity allocation for that Iteration/Sprint. How do we calculate the projected completion date for an Iteration? We can allocate capacity to an Iteration/Sprint from iteration settings. so as per above setting 100% capacity of a team member will be counted as 8 hours a day. 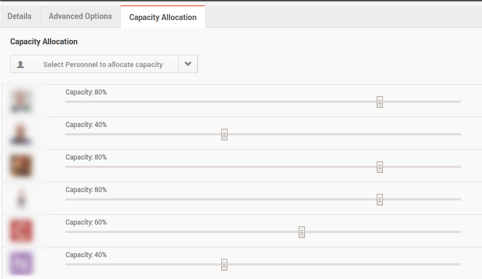 If 6 members are allocated with 100% capacity to an iteration then total available capacity is 6*8=48 hours/day.